Tony Spiteris was a Greek art critic based in Venice, who was then acting as General Secretary of AICA (International Association of Art Critics). From the mid-sixties, he collaborated with the Cyprus Government as advisor on cultural matters, and in this capacity he curated the first national participation of Cyprus in the Venice Biennale. Among various proposals, Spiteris set apart six young artists with a mean age of 35, bringing forth some of the most pioneering work on the Cypriot scene at the time, and reflecting its gradual and delayed transition to the movements of modernism and abstraction. The works presented varied in style and form; there was painting, reliefs and wood sculptures in series, moving between geometric abstraction and abstract expressionism, and elements of constructivism and surrealism. Evidently marked by the artists’ formative training in various centres abroad, they nevertheless retained, as Spiteris put it, “a taste of their native land, without ever slipping into folklore rhetoric”. The artists shared a small space at the back of the Italian Pavilion to exhibit a total of 18 paintings and 4 sculptures. The hall was vast, separated by panels and shared by many countries that did not possess a space of their own. Despite all sorts of difficulties, the first Cypriot exhibition was properly set up, the resulting feedback was encouraging and the thrill of this new beginning was extraordinary. Chrysochos was the only one absent from the Venice opening; Christoforos Savva, already suffering from an illness, died of heart attack in Sheffield a few weeks later. 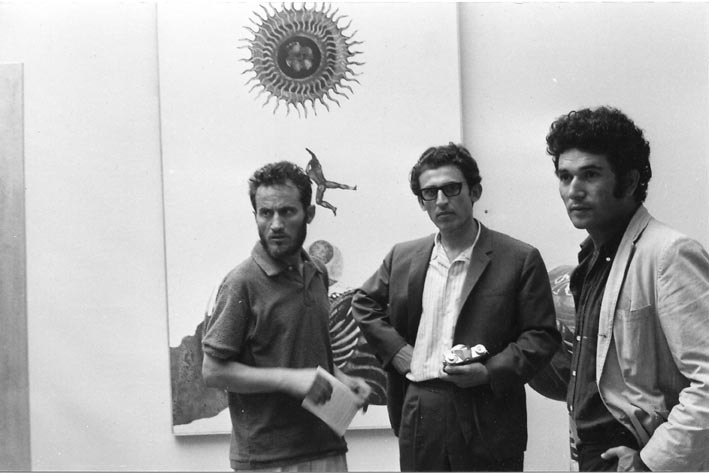 Christoforos Savva, George Kyriacou and George Skotinos at the Cyprus Pavilion in Venice. Andreas Chrysochos (b.1929, Milia, Famagusta) lives and works in Nicosia. He studied painting at Goldsmiths’ College, School of Art of the University of London and psychology of children’s art at N.E. London Polytechnic. He worked as teacher of art at the Pedagogical Academy and Art Inspector. Involved in art criticism, icon-painting and calligraphy. Chrysochos represented Cyprus at the 34th Venice Biennale of Art, Cyprus’s first participation, with five other Cypriot artists. Costas Joachim (b.1936, Bellapais) lives and works in Cyprus. He studied art at Bath Academy or Art in Corsham, UK, and the University of Bristol, from 1960, with specialisation in painting, sculpture and visual perception. He also specialized in art education. In 1963 he was awarded the Degree of Fine Arts and Education from the University of Bristol and in 1975, he received the Certificate of Fine Art of the School of Fine Arts of the Polytechnic in Athens. In 1981 he received the Diploma of Post Graduate Studies in aesthetics and history of art, at Byam Shaw and Chelsea College of Art, London. Joachim represented Cyprus at the 34th Venice Biennale of Art, Cyprus’s first participation, with five other Cypriot artists. George Kyriacou (b.1940, Exo Metochi) lives and works in London, Nicosia and Aegina. He studied sculpture at Chelsea School of Art in London (1961-1964). Between 1964-1969 he worked as an art tutor in Cyprus. In 1972, he was awarded a scholarship by the French government to study Museology in Paris. In 1976-1977 he studied Arts Administration at the Polytechnic of Central London and was awarded the diploma in the Arts and Leisure Administration. Kyriacou represented Cyprus at the 34th Venice Biennale of Art, Cyprus’s first participation, with five other Cypriot artists. Christoforos Savva (1924-1968, Marathovounos) lived and worked in Nicosia. After serving in the Cypriot Regiment of the British Army during World War II, he moved to London for studies at St. Martin’s School of Art and the Central School of Art, before enrolling at Heatherley’s School of Art where he studied until 1953. During the next two years, he spent time in Cyprus where he presented his first solo exhibitions and became involved in the local artistic milieu, while being one of the founders of the Pancyprian Union of Art Votaries. In 1956, he returned to London and later moved to Paris for further studies at the Académie Montparnasse, under André Lhote. The end of the decade found Savva settling in Nicosia, where he quickly established himself as one of the leading artists in a vibrant art scene, both through his own art practice and through the activities of “Apophasis” [Decision] Gallery, Nicosia. “Apophasis” which he founded in 1960 in collaboration with Welsh artist Glyn Hughes, was the first independent cultural centre of the newly founded Republic of Cyprus. As a space where creative synergy and exchange could take place, the gallery was soon to become the epicentre of intellectual and cultural activity on the island, hosting numerous exhibitions, lectures, plays and film screenings. 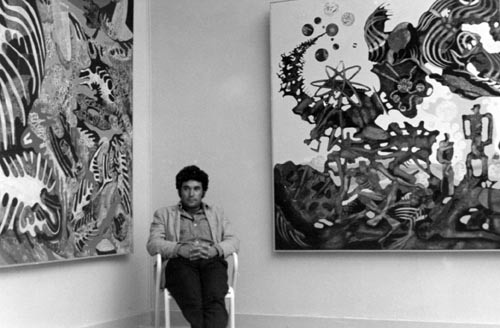 In 1968, Savva was one of the artists selected to represent Cyprus in its inaugural Pavilion at the Venice Biennale, but only a few weeks after the opening, he died suddenly in Sheffield, UK. On the occasion of a double fifty-year anniversary associated with the participation of Christoforos Savva in the first official show of the Republic of Cyprus at the Venice Biennale in 1968, as well as the subsequent death of the artist in the same year, his work will represent Cyprus at the 58th Venice Biennale of Art. George Skotinos (b.1937, Limassol) lives and works in Ayia Napa. He studied at the National School of Drama in Greece (1961 – 1964). He continued his studies in film-making in New York at the School of Visual Arts and at the Movie Subscription Group Schools (1964 – 1967). He also obtained a scholarship from Ford Foundation for studies in Painting (1976 – 1977). His practice, which moves between realism, abstraction and surrealism, is artistically recognizable for bearing its own personal style through circles of thematics. Skotinos represented Cyprus at the 34th Venice Biennale of Art, Cyprus’s first participation, with five other Cypriot artists. Stelios Votsis (1929-2012, Larnaka) lived and worked in Nicosia. He studied at St. Martin’s School of Fine Arts, Sir John Cass College and the Royal Academy of Arts in London. His early work of portraits, landscapes and still life, he forms a personal journey that leaves the mid ’60s to devote himself to geometric comporsitions with constructivist elements, integrating his work into modern artistic tendencies. The geometric elements, after the events of 1974, experiment with the human form, adding layers to his painting subjects concerned with existentialism. Votsis represented Cyprus at the 36th Venice Biennale of Art together with four other Cypriot artists. Tony Spiteris was a Greek art critic based in Venice. During that period he was acting as General Secretary of AICA (International Association of Art Critics). From the mid-’60s, he collaborated with the Cyprus Government as advisor on cultural matters, and in this capacity he curated the first national participation of Cyprus in the Venice Biennale.